1. 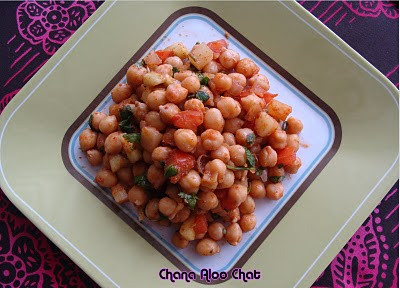 Pressure cook chana with little salt. 2. Peel the skin and pressure cook potato and chop. 3. Peel the skin of cucumber and chop. 4. Chop onion, tomato, green chilies and cilantro. Grate ginger. 5. Dry roast cumin powder. 7. Add grated ginger, red chili powder, cumin powder, chat masala, salt and tamarind paste/lemon juice mix well. 8. Finally add chopped cilantro and serve.